"Guide to Lindos Rhodes, one of the top island sights - what to see and how to get there!" As your Mediterranean cruise ship approaches the island of Rhodes, you'll probably be hearing a lot about Lindos from your fellow cruise guests. 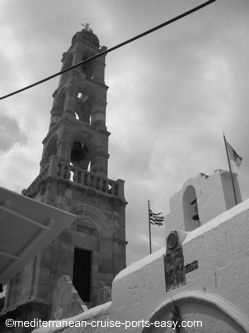 Lindos town is a quaint attractive little town on the island of Rhodes Greece that has grown around the ancient Lindos acropolis which was a center of civilized life, art and culture while Rome was just a little Etruscan village. It is located approximately 50 km south of the Rhodes Old town which you can locate on our Rhodes map, on the East coast of the island. It is definitely worth it to visit Lindos on Rhodes, but if this is your first time ever visit to the island, make sure you don't neglect the Old town of Rhodes which has enough sights to keep you busy for a day alone! Lindos on Rhodes island is a very popular destination for those visiting the island, and has in fact become a regular vacation spot for many families and couples that fly in and stay each year. It is especially popular with the British who gladly make it their second home during summer months. It has a very relaxed feeling to it and the town itself, as well as its nearby beaches, is very well kept. It is a protected historical site, too. Medieval architecture gives it a mysterious charm but it's on a much smaller scale than in the Old town of Rhodes. DINING-ROOM TABLE TIDBIT: Lindos was the birthplace of Charis of Lindos, the architect of the Colossus of Rhodes. Locals are very friendly and helpful, many of which run or operate some sort of local business like apartments/villas for rent, small “mom and pop” stores, bars and restaurants. Many people enjoy (as did we) a lunch or dinner in one of the rooftop restaurants, some with quite impressive views. Lindos town has a lot of narrow little cobble-stoned streets to explore, so you may want to wear comfortable walking shoes that don't slip. Also, temperatures in Lindos town are always a bit higher than in the Old town of Rhodes, so make sure you have a bottle of water with you! 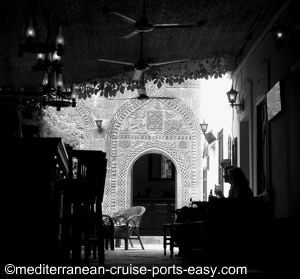 It’s really enjoyable admiring and taking photos of the whitewashed walls and numerous stone pebble mosaics that adorn many streets and entrances into hotels or shops. 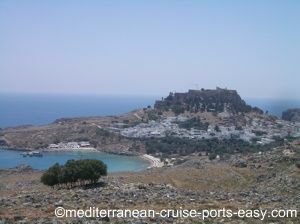 Lindos is also well known for its Lindos Acropolis that towers above it, its Lindos beach and the nearby St Paul’s Bay. St Paul’s Bay is a small bay that is quite rocky, but has clear water and a couple of small beaches to enjoy. It’s very popular for weddings held at its little chapel. This bay is within walking distance from Lindos town. DINING-ROOM TABLE TIDBIT: It is said that Saint Paul (hence the name of the bay) had to land here to take cover from a storm at sea, so bringing Christianity to the island aswell. Of course, as a Mediterranean cruise guest with limited time, your best options for getting to Lindos (and have enough time to explore the Rhodes Old town too) will be to either book an organized cruise line shore excursion, rent a car/scooter near the cruise ship dock, or hire a taxi. TIP: Remember that renting a car/scooter, hiring a taxi is done at your own risk and you are always responsible to get back to the ship on time. Keep in mind that whether you are taking a taxi, a rental car or going to Lindos Rhodes with one of the cruise line shore excursions, you will have to walk about a hundred meters or so to the town centre and then some more to the top of the Acropolis. Car parks at the bottom of Lindos get very busy so if you're going with a rental car, make sure you go very early before the cruise ship tours get there!